The three-month-old calf, named Joe by wildlife officials, made headlines earlier in the week when the poignant photograph was published. 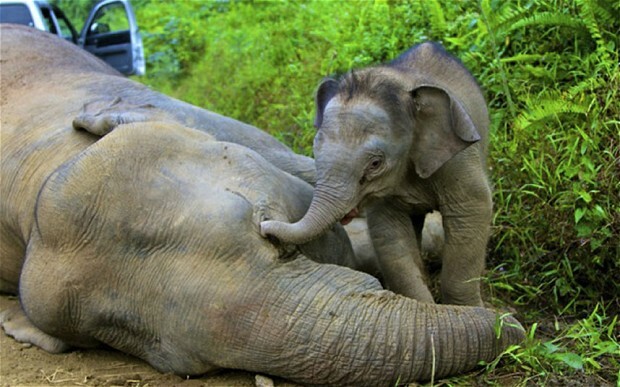 His mother was one of 14 rare Borneo pygmy elephants that have been found dead of suspected poisoning in recent days in a series of fatalities that has shaken conservation efforts. The decomposed remains of the latest known victim were located on Wednesday, said Laurentius Ambu, director of the wildlife department in the Malaysian state of Sabah on Borneo island. Officials believe the animals may have been poisoned, possibly by substances left out by workers at nearby oil palm plantations to deter the animals from eating their palm fruit. They fear more dead pygmy elephants - an endangered species - could be found because they usually roam Borneo's jungles in herds of 50 to 60 animals. Masidi Manjun, Sabah's tourism, culture and environment minister, warned it would be a "challenging task" to keep Joe alive as he was consuming only half his normal 30 litres (7.9 gallons) of milk daily. 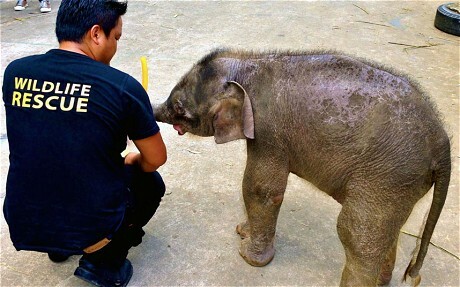 "(Joe) is surviving, but it is going to be a challenging task," he told AFP news agency by phone from Sabah. Joe is being kept in quarantine at a wildlife park and has lost 22 pounds after being traumatised by an 800 kilometre (497 mile) road journey to the park, the Star newspaper said Thursday. State officials on Tuesday released photos of the original 10 pachyderms to be found dead, including one of the orphan and its dead mother. A chemists' report on the beasts would be completed next week and could reveal what killed them. Poisoning is suspected due to severe ulceration and bleeding in the animals' digestive tracts. Dozens of wildlife officials, police and other personnel have been dispatched to comb through the Gunung Rara reserve, where the carcasses have been found, for other possible victims. Masidi vowed to push for severe punishment including a stiff jail sentence for anyone found to have maliciously poisoned the animals. "It is a combination of anger and sadness. I am still grieving. I fail to understand human behaviour," he said.